A total of 529 entries were made in the 2017 World Series of Poker Europe €10,350 no-limit hold’em main event, which was held for the first time in the event’s history. 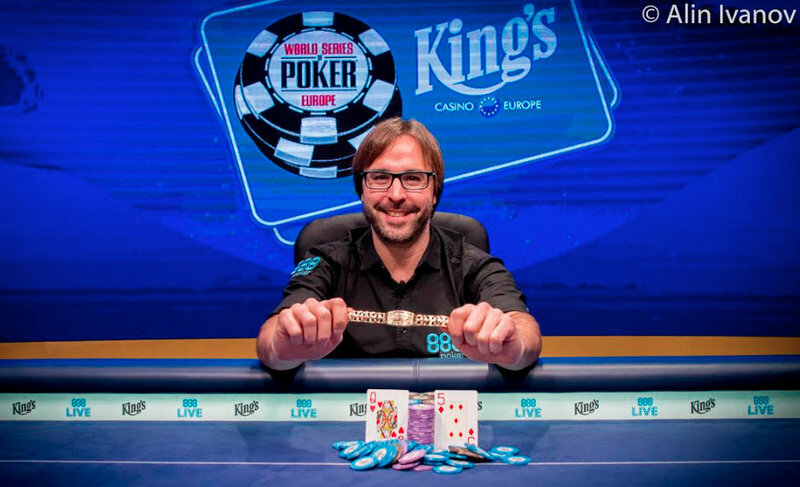 In the end it was 36-year old Spanish poker pro Marti Roca De Torres who emerged victorious, capturing his first WSOP gold bracelet and the top prize of €1,115,207 ($1,301,815 USD). The former economics teacher had only $30,000 in prior live tournament earnings before taking down this massive title. He won his way into this event in a €220 buy-in satellite on 888poker.es and was then able to turn his entry in this event into a seven-figure score. Roca De Torres entered the final day in second chip position with six players remaining. The chip leader heading into the day was American poker pro Maria Ho, who was looking for her first gold bracelet at her fourth WSOP final table. Ho’s day got off to a rough start when she doubled up Niall Farrell, her most accomplished final table opponent, early on in the day. Farrell made this final table only a week after earning his first gold bracelet in the €25,000 buy-in WSOP Europe no-limit hold’em high roller. The win saw Farrell complete poker’s triple crown, having captured major titles at the WSOP as well as on the World Poker Tour and the European Poker Tour. Farrell’s double up saw him become more of a factor at the final table, but his hope was short-lived. Not long after doubling up Farrell, Ho and Roca De Torres got involved in a massive pot that dramatically shifted the outcome of the final table. Ho, who was left short after losing to Farrell, moved all in for 1,260,000 from early position. Roca De Torres made the call from the small blind and Farrell moved all-in for 6,860,000 from the big blind. Roca De Torres snap-called and flipped over the A A . Farrell was on the bad end of the classic cooler, having picked up the K K . Ho was also in quite poor shape with the A J . The board ran out 9 6 3 9 8 . Ho was eliminated in sixth place, earning €174,365 ($203,542 USD). Farrell’s larger chip stack meant that he took 5th place for €239,639 ($279,738 USD). Roca De Torres soared into the chip lead following the double elimination, having roughly double the total chips of the other three players combined. Roca De Torres’ road to the title wasn’t necessarily a smooth one despite his huge lead after winning that key hand. His opponents were able to score some key double ups to even the playing field a bit, and after a while Italy’s Gianluca Speranza seemed the be wresting control of the final table during four-handed action. In fact, after Mathijs Jonkers eliminated Robert Bickley in fourth place for €335,089 ($391,159 USD), Roca De Torres was left the shortest stack among the three remaining players. Speranza busted Jonkers	in third place ($556,332 USD) to set up the final showdown with Roca De Torres. The Italian began heads-up play with roughly a 3-to-1 chip lead. The two battled it out for 75 hands before the champion was decided. The were a few lead changes, and the hand that really determined the winner came with the two relatively close in chips. With blinds of 250,000-500,000 and an ante of 75,000 Roca De Torres moved all in for 12,725,000 and Speranza called with the A J . Roca De Torres was flipping with his 5 5 . The flop brought the A 9 3 to give Speranza a pair of aces and the decisive lead in the hand, but the 5 on the turn completely turned the tables and gave Roca De Torres a set of fives. The 9 on the river secured the pot for Roca De Torres and left Speranza with less than two big blinds. He was eliminated on the following hand when 10 8 couldn’t outrun Roca De Torres’ Q 5 . With that Speranza was sent to the rail as the runner-up, earning €689,246 ($804,578 USD) for his impressive showing.